Nike has been fined by the European Commission for restricting the cross-border sale of goods carrying the logos of some of Europe's top football clubs. The €12.5m (£10.7m) fine concerns merchandise such as mugs, bed sheets and stationery, which carries the brand of the club, but not Nike's trademark. 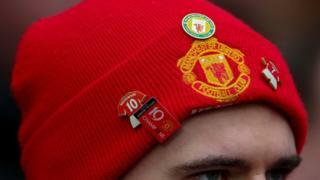 Manchester United and Barcelona goods were among those affected. The commission found Nike restricted firms who made and sold the products from selling them across borders. "Football fans often cherish branded products from their favourite teams," said competition commissioner Margrethe Vestager. "Nike prevented many of its licensees from selling these branded products in a different country leading to less choice and higher prices for consumers." As well as Manchester United and Barcelona, the commission said products bearing the brands of Juventus, Inter Milan and AS Roma were also affected, as well as national federations like the French Football Federation. The illegal practices occurred between 2004 to 2017, the commission said. Nike received a 40% discount on its fine for co-operating with the investigation. "Nike co-operated with the commission beyond its legal obligation to do so, in particular by providing the commission with information that allowed it to extend the scope of the case," the commission said. "As a result, the investigation included ancillary sport merchandise of a number of additional clubs."